Intel said it is reinventing the personal computing experience once again with the creation of a new mobile computing category dubbed the Ultrabook. "Not since the introduction of Centrino more than eight years ago have we witnessed such a fundamental transformation of personal computing," said Intel's PC Client Group vice-president and general manager, Mooly Eden. Eden, who delivered the second keynote of the Intel Developer Forum in San Francisco, then proceeded to run through the basic features of the Ultrabook. Its characteristics include a thin and light design that is less than an inch thick and below 1kg in weight, and doesn't sacrifice anything in the way of performance. In fact, Eden ran through a series of demonstrations that showed off the responsiveness and solid security features that are built into the Ultrabook platorm. Among them included Intel's Rapid Start technology that managed to jolt an Ultrabook out of hibernation mode in about four seconds as compared to as long as a minute in some current notebooks. Security is also a major feature in the Ultrabooks and Intel showed off its processor-based Identity Protection feature that can thwart hackers even if they have managed to get hold of your login and password information. Intel-linked McAfee will also have an antitheft service for the Ultrabooks next year that will take advantage of Intel chip-level technologies and will provide device and data protection such as device lock, data wipe and location tracking. Eden said that the Ultrabook vision is a multi-year, industry-wide effort that will roll out in three phases. "Today's devices powered by our second generation Core processors are already giving people a personal computing experience that they've never had before and we won't stop there." The first Ultrabooks will be available in time for the holiday season later this year and will be powered by Intel's second generation Core processors, also commonly known as Sandy Bridge. Incidentally, Eden said that Sandy Bridge is the fastest-shipping processor in the company's history with 75 million shipped since it was introduced earlier this year. 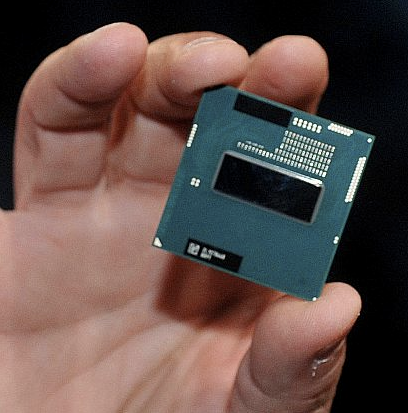 Phase two will begin next year and this is when Intel's next generation Ivy Bridge processors will come into play. Ivy Bridge is built on a 22nm (nanometre) process and has 1.48 billion 3D tri-gate transistors as compared to 32nm Sandy Bridge processors that have 1.16 billion transistors. In essence Ivy Bridge processors will be more power efficient and will deliver better graphics and media performance as well. Eden said that Ivy Bridge can even deliver better performance than existing laptops despite being a low voltage chip thanks to Intel's boosted Turbo mode that allows a 17-watt Ivy Bridge processor to reach the same frequencies as a regular 35-watt Sandy Bridge mobile processor. In fact, Eden clarified that Ivy Bridge is actually a "tick plus" in Intel's "tick-tock" cadence roadmap as it is not merely a die shrink of the 32nm Sandy Bridge but has graphics and media delivery improvements. TINY BUT POWERFUL: The third generation Intel Core processor, codenamed Ivy Bridge, will power the 2012 Ultrabook devices. - Intel. Eden also shared the stage with Brett Carpenter from Microsoft's Windows Ecosystem Group to show off the Windows 8 operating system working and running several applications on Intel-based Ultrabook devices. They highlighted the broad collaboration between the two companies and pointed to the future opportunities that Windows 8 will present across multiple compute devices such as Tablets, hybrids and new form factors like the Ultrabook. In fact, Carpenter started off his demo with a prototype Intel-based Tablet running Windows 8 before turning his attentions to the Ultrabook. Intel also turned the spotlight on the Thunderbolt I/O technology, which enables high-speed storage, media capture devices and displays to all connect via a single, thin cable. According to Eden, Thunderbolt will find its way to some Acer and Asus Ultrabook models next year. 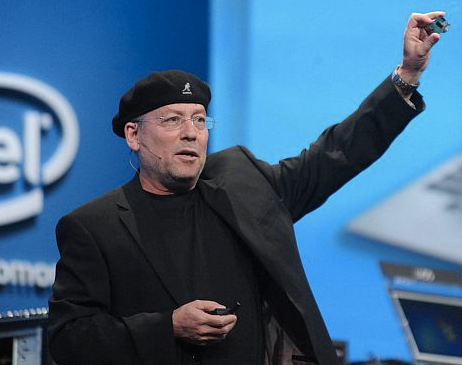 While the announcements of Ivy Bridge were impressive enough, Eden pulled a rabbit out of his hat (figuratively of course as the colourful Intel vice-president is seldom pictured without a beret) by showing off a working next-generation Haswell processor at the end of his keynote. Due out in 2013, the 22nm Haswell chip is designed to offer 10 days of connected standby battery life and a full day's worth of usage on a single charge. According to Eden the goal is to achieve standby connected power usage that is 20 times lower than current Sandy Bridge processors. What this means is that your Ultrabook will be able to last 10 days in standby mode where it would still be working in the background, getting your e-mail, social network and message updates. Eden demonstrated Haswell running multiple applications simultaneously and said that it would "complete the Ultrabook revolution" once it starts finding its way into Ultrabooks two years from now.